The week-long festival features music, parades, dancing, and fireworks. 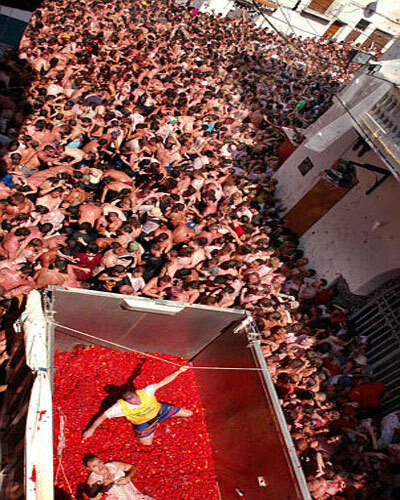 On the night before the tomato fight, participants of the festival compete in a paella cooking contest. It is tradition for the women to wear all white and the men to wear no shirts. This festival started in a casual way in 1945, but wasn’t officially recognized until 1952. Approximately 20,000–50,000 tourists come to the tomato fight, multiplying by several times Buñol’s normal population of slightly over 9,000. 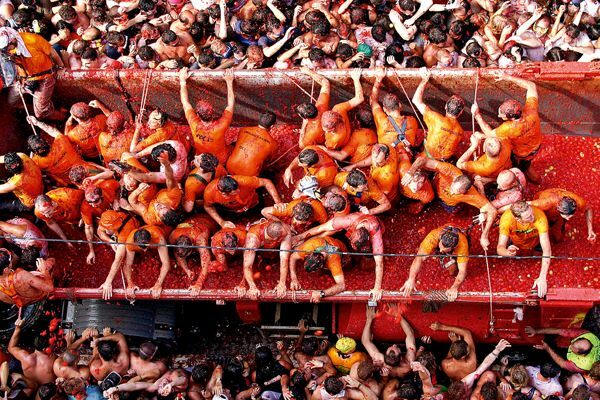 There is limited accommodation for people who come to La Tomatina, and thus many participants stay in Valencia and travel by bus or train to Buñol, about 38 km outside the city. 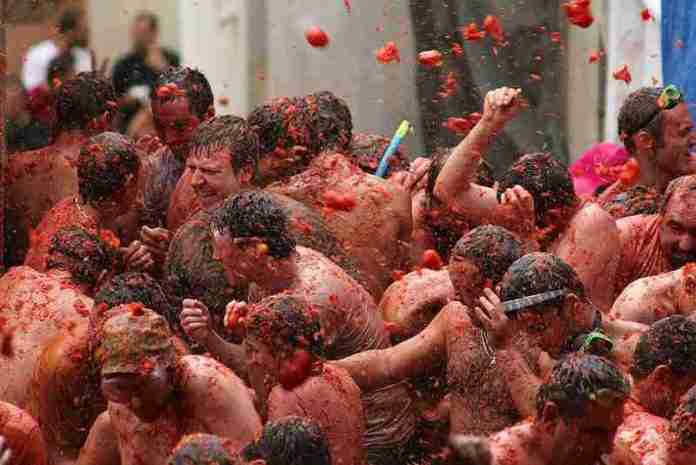 Having been to La Tomatina, it is really a violent, testosterone-filled, painful experience. For a woman, I wouldn't recommend it, unless you fancy being groped by agressive men with a mob mentality who try to rip womens' shirts off. After the few tomatoes are distributed, people start getting restless, then tie their tomato soaked t-shirts into a knot and begin throwing them at other people's heads. Then the plastic bottles start getting thrown, then people's shoes. After the ordeal is over, and you're nursing your sore head, you then have to squish through the ridiculously crowded street to exit, almost being crushed to death by other people acting like animals. Can you tell I didn't enjoy it? This is something I would love to experience once in my life! Thought it's slightly heartbreaking to see so many tomatos wasted when so many people are starving.